Me and Pop in 1971. I was very proud of his catch. I have loved water all my life. It seems all babies do. I was no exception when, as a toddler, I ignored my mother’s warning and jumped into the deep end of a pool. I recall the reflection of sun’s light shimmering in the blue depths and thinking how peaceful it seemed down there. I wanted to be there. As I sunk to the bottom, I was aware that I could not breathe and had no strategy to return to open air, but I wasn’t scared. The silence seemed natural. It was calming. I genuinely did not understand what all the poolside fuss was about after the lifeguard so rudely snatched me from my Zen moment of being one with my ancestral neighbors and relatives. 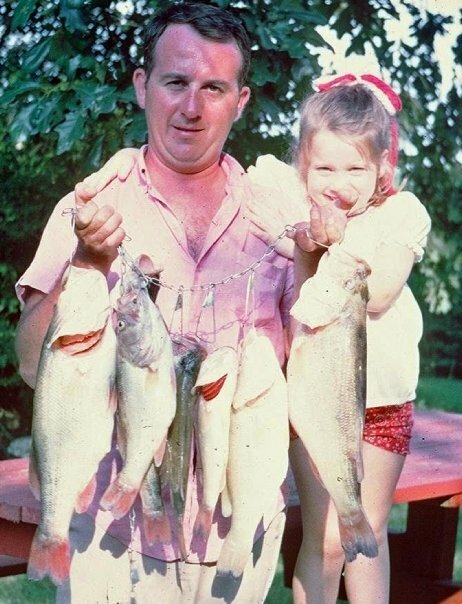 My early childhood also included many hours either on a lake bank or in a boat with my Pop, who loved to fish for Largemouth Bass. And we both loved to eat them. While fish are a food source for millions of humans, they are much more than that. This month, I will be writing about important conservation topics that affect fishes all over the globe. But first, here are some basic fish facts. There are approximately 25,000 species of fish, with about 200 newly identified species each year. Fish live in a broad variety of habitats including seasonal ponds, intermittent streams, tiny desert springs, open oceans, deep oceanic trenches, cold mountain streams, brackish coastal bodies of water and more. Fish are found living in temperatures as low as 29°F and as high as 104°F. Modern fishes consist of three major groups that have been evolving for at least 500 million years. They are Agnatha (jawless fishes),Chondrichthyes (cartilaginous fishes) which includes sharks, rays, skates, sawfishes, and ratfish and Osteichthyes (bony fish), which includes deep-sea fish, bottom fish, coral reef fish, coastal fish and surf fish. Only 58% of modern fish species reside in ocean waters and 41% live in freshwater. The other 1% move between saltwater and freshwater environments on a regular basis. Aristotle was the first to study and write about fish and made the first formal observations that distinguished them from whales. He identified about 117 species of fish. Most fishes fall into one of six broad categories of body configuration: rover-predator, lie-in-wait predator, surface-oriented, bottom fish, deep-bodied fish, and eel-like fish. Most fish have senses of sight, hearing, smell and taste just like humans. But they possess other senses that allow them to perceive water particle displacement and electrical currents. Popular examples of fish behavior are fish shoaling and schooling, which are two distinct behaviors. Shoaling is when any group of fishes remains together for social reasons. Schooling is a polarized, synchronized shoal. Fish shift in and out of schools on a regular basis. An estimated 25% of all fishes shoal throughout their lives and approximately half of all fishes spend at least part of their lives shoaling. In spite of all this diversity, there is a decline in fish diversity and abundance due to human-related activities of exploitation, introduction of nonnative species, alteration of habitat and pollution. The purpose of The Whisker Chronicles is never to persuade anyone on issues of evolution or to stir debate on the topic. But the appearance of a connection between humans to water dwelling animals is pretty compelling. I choose to believe that connection…..that instinct, is what drove me to “jump” as a toddler and continues to drive my amphibious tendencies. According to this video, I am not alone. 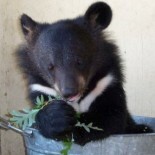 This entry was posted on May 4, 2014 by Maymie Higgins in Fishes, Maymie Higgins, Wildlife.